Otitis externa, (swimmers ear) is an infection of the external ear from bacterial or fungi growth in the ear canal. This is caused by small drops of water that get trapped within the canal and encourages bacteria to proliferate. As a result of frequent exposure, the skin thickens inside the ear and makes the canal narrower which can cause in eventual hearing loss. Unlike silicon earplugs or earplugs that penetrate the canal, Doc’s Proplugs will not irritate the ear canal or disrupt earwax production, which is nature’s protection from foreign microorganisms. 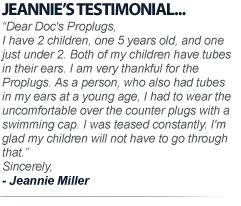 Proper use of Doc’s Proplugs prevents the flushing out of natural earwax which keeps the ear moisturized and protected. 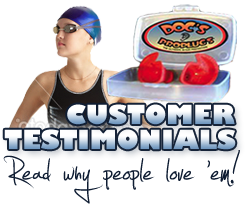 Ask your local ENT physician or a sports store about Doc’s Proplugs and ask to be fitted.